I’m very honored to be featured as magazine cover and have an extensive interview and portfolio presentation on 20 pages spread in the last issue of F11 Magazine. You can read the magazine online or download the PDF version from F11 Magazine website. You can also read there the other issues of the magazine that are very interesting. F11 Magazine is a popular New Zealand photography magazine that focuses on high-quality photography and on featuring photographers who show something different, showcasing their work, artistic philosophy and way of working. 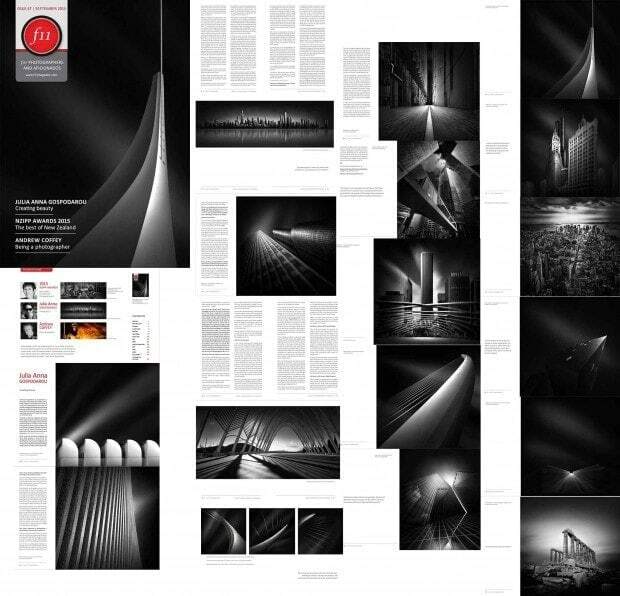 In my F1 Magazine interview you can read about why I create black and white fine art photography and how I do it, how I process my images, what Is the equipment I use and how I use it, details about my educational activity in photography, about my best-selling 424-page book From Basics to Fine Art, written with Joel Tjintjelaar, plus many more other things related to my work and artistic evolution. I hope you will like the interview and you will find in it helpful tips for your photography. Let me know in the comments what you think. In a couple of days, I’ll also publish one more fine art street photograph I shot a few days ago at my latest private workshop in Athens. « LIVING YOUR PHOTOGRAPHY. WHEN IS A PHOTOGRAPH READY TO BE PUBLISHED?